A new report describes rapid advances in carbon science. The carbon in the atmosphere, ocean, surface life, and other shallow, near surface reservoirs accounts for only about 10% of Earth’s carbon. Where is the other 90%? What is it doing? Does it matter? The Deep Carbon Observatory (DCO), an ambitious 10-year (2009-2019) program of exploration and experimentation, pursues the mysterious 90% while building a new scientific field with a network of scientists from more than 40 countries. Recent results from DCO researchers are filling in the global carbon puzzle with findings that extend our understanding of the origins and limits of life on Earth, what erupts from volcanoes and leaks from sea floors, and what descends back into Earth’s great depths. “The reservoirs of carbon deep in Earth are huge and active: They convect and outgass, they become diamonds and life. That carbon has a big say in the habitability of Earth’s surface,” remarked Russell Hemley (Carnegie Institution of Washington, USA), co-executive director of DCO. 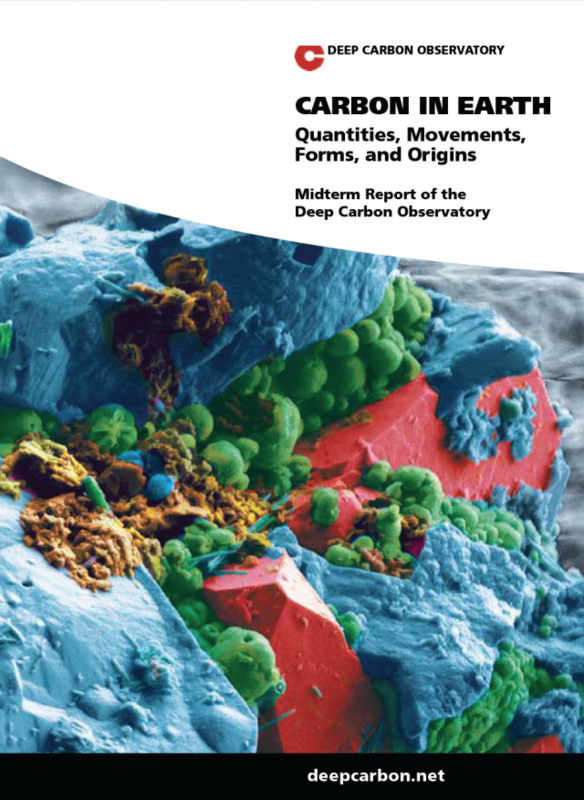 Hemley synthesized the first five years of DCO’s achievements in “Carbon in Earth: Quantities, Movements, Forms, and Origins.” DCO will release this midterm scientific report during the 2014 American Geophysical Union (AGU) Fall Meeting in San Francisco, USA, 15-19 December. The report will be available online at 8:00 a.m. Pacific Time Monday, 15 December 2014, and in print at a public reception on Tuesday, 16 December from 6 to 9 p.m. at Restaurant LuLu, 816 Folsom St., San Francisco. Hemley, Executive Director Robert Hazen (Carnegie Institution of Washington, USA), and their colleagues in the DCO Science Network invite journalists interested in DCO’s achievements and plans to attend the reception. Quantities: Since its discovery about 25 years ago, researchers have speculated about the size of the “deep biosphere,” the subterranean mesh of tiny forms of life that appears to pervade fluids in deep pools and fracture zones. New experiments show more widespread geologically produced methane than previously thought with “potential to support an extensive deep biosphere.” An AGU presentation will address not only the size but also the stability of these biological and carbon dioxide reservoirs. Movements: Several DCO presentations will improve the traffic charts of carbon – up, down, and sideways. These include overlooked paths and timelines of carbon fluxes in deep Earth as well as improved estimates of volcanic contributions to atmospheric carbon dioxide levels and new information on diffuse degassing, including how emissions seeping out of soils vary daily and seasonally. Forms: The thousands of forms that carbon may take depend crucially on temperature and pressure. Researchers will report on a new deep Earth model whose simulation of the movement of tectonic plates and associated geochemistry may help explain the release of nitrogen that created Earth’s unique atmosphere. Origins: Could life have originated deep in Earth and risen? New research shows microbial communities survived for 30 million years in fluids buried 2.5 kilometers underground, hinting at the hospitality of deep environments. Water is essential for life, and a report on expanded global sampling of ancient deep waters in fractures of rocks is adding possible scenarios for the origins and spread of life on Earth. To schedule interviews with DCO scientists, please contact Katie Pratt, DCO Communications Director. View DCO’s AGU Tip Sheet for dates and times of DCO presentations and events. Presentations at the AGU Fall Meeting will report on research into the origins and forms of deep carbon through methane production, ancient water, and the deep biosphere; movement of deep carbon through volcanoes and plate tectonics; and storage of deep carbon through natural sequestration of carbon dioxide. Giuseppe Etiope and Artur Ionescu (Istituto Nazionale di Geofisica e Vulcanologia, Italy) recently identified the rare metal ruthenium as a natural catalyst for abiotic methane production, the production of methane through purely geologic processes. Because abiotic methane production may offer a crucial early chemical step toward the evolution of our living planet, their research provides clues to the origins of life on Earth, in addition to expanding the short list of known catalysts for this important reaction. A collaboration between geochemist Riikka Kietäväinen (Geological Survey of Finland) and microbiologist Merja Itävaara (VTT Technical Research Centre of Finland) expanded DCO’s work characterizing deep ecosystems in diverse geologic settings around the world. Earlier this year, researchers documented the presence of a microbial community living in fluids buried 2.5 kilometers underground. Subsequent work clarified that these fluids had been trapped for more than 30 million years, suggesting that resident microbes, completely isolated from the Sun’s heat and light, rely entirely on geologic sources of energy for their survival. DCO’s Barbara Sherwood Lollar (University of Toronto, Canada) and colleagues T.C. Onstott (Princeton University, USA) and Chris Ballentine (Oxford University, UK) previously isolated billion-year-old water from the depths of an Ontario mine in 2013. Sherwood Lollar will share results on abiotic and biogeochemical carbon cycling in these systems in two talks at the AGU Meeting. DCO researchers are collecting data across the globe and developing mathematical models to expand understanding of the reservoirs and movement of carbon from deep Earth to the surface and back. DCO’s DECADE (DEep CArbon DEgassing) initiative is creating a broad global volcano monitoring system to measure movement of carbon from Earth’s interior to the surface. DECADE scientists Alessandro Aiuppa, Philippe Robidoux (Università di Palermo and Instituto Nazionale di Geofisica e Vulcanologia, Italy), and colleagues concentrated their efforts on the active Central America Volcanic Arc, recently publishing direct measurements of volcanic carbon dioxide emissions. DCO scientists also monitor diffuse outgassing of carbon dioxide from the ground surrounding volcanoes between eruptions. Since 2002, Fátima Viveiros (Universidade dos Açores, Portugal) and colleagues have monitored soil degassing in the Azores archipelago. Their data reveal variations in carbon dioxide degassing on daily to seasonal scales, highlighting sensitive relationships between deep Earth and surface processes. Understanding of past and future climate will benefit from better information on natural outgassing of carbon, not only as carbon dioxide but methane as well. Viveiros will not be at AGU, but is available for comment via email, Skype (fatima_viveiros), or phone (office 00351296650147; mobile 00351919578648). Members of the DCO Science Network are performing basic research on all aspects of Earth’s global deep carbon cycle, providing insights into processes governing geologic storage of carbon dioxide. While studying a natural underground reservoir of carbon dioxide at Bravo Dome in New Mexico, USA, Marc Hesse, Kiran Sathaye, and colleagues (University of Texas at Austin, USA) found that carbon dioxide remained naturally sequestered in a saline aquifer for more than a million years. Their work also highlights that not all carbon emanating from Earth’s interior is released via volcanoes or diffuse outgassing. Instead, very large quantities of deep carbon are captured and retained by rock formations in Earth’s upper crust, an often-overlooked reservoir of the deep carbon cycle. “With numerous analogous aquifer systems in North America, our work lessens uncertainty about the selection of suitable sites for safe, long-term geological carbon storage,” said Hesse. DCO scientists Sami Mikhail (University of Bristol, UK) and Dimitri Sverjensky (Johns Hopkins University, USA) will discuss their use of a model, developed by Sverjensky, to estimate how subduction-zone plate tectonics and the resulting release of nitrogen gas from Earth’s mantle contributed to the evolution of Earth’s unique, habitable atmosphere. Most of the aforementioned research will be presented at the 2014 AGU Fall Meeting. Contact Katie Pratt, DCO Communications Director, to schedule interviews with DCO scientists. View DCO’s AGU 2014 Tip Sheet for specific dates and times for DCO presentations. direct interaction with DCO scientists, and subscription to our monthly newsletter. We encourage all journalists interested in deep carbon science to join. A 10-year global quest to discover the quantity, movements, forms, and origins of Earth’s deep carbon; to probe the secrets of volcanoes and diamonds, sources of gas and oil, and life’s deep limits and origins; and to report the known, unknown, and unknowable by 2019. The Deep Carbon Observatory continues to seek the collaboration and contributions of all scientists, writers, and artists interested in the unfolding, and as yet untold, story of carbon in Earth. Conducting expeditions, laboratory experiments, and simulations, we ultimately aim to advance significantly, and perhaps change fundamentally, our understanding of carbon and the role it plays in our lives. DCO aims to create legacies of instruments measuring at great depths, temperatures, and pressures; networks sensing fluxes of carbon-containing gases and fluids between the depths and the surface; open access databases about deep carbon; deep carbon researchers integrating geology, physics, chemistry, and biology; insights improving energy systems; and a public more engaged with deep carbon science. More about the Deep Carbon Observatory.